The Panasonic Milano ER-GB40-S is a wet/dry hair and body trimmer that you can use in the shower. It is one of Panasonic's newer models, and it comes with standout features like a rotating dial and 19 trim settings. The Milano is a wet/dry beard trimmer and body groomer. It has 19 length settings 1-10mm with 0.5mm increments that can be changed using a dial. (In inches: 1/32'' - 3/8'', increments 1/64''). Overall it's an affordable trimmer that gives a great value. Charging Time: Several hours to fully charge. Length Settings: 19 (with a dial). The Panasonic Milano is ideal for men that are looking for a long-lasting, barbershop quality shaver that will last for at least three years before you need to consider replacing it. The ER-GB40-S is considered a high-end trimmer and gives a great value for the price. It’s cordless, lightweight and easy to use, and you can use it with or without shaving creams, gels or other shaving products. In addition to its wet/dry capabilities, it's completely waterproof which means you can use your ER-GB40-S in the shower without worrying about affecting its overall lifespan. The accessories list is short, but you don't need much with this trimmer. The ER-GB40-S comes with a sleek charging dock which glows bright red when it's charging and will disappear once you lift the shaver off of its dock. You also get a small brush that can get to all the tiny curves and edges and clean stray hairs. There's also an oil bottle to keep the trimmer's blades in good shape. Additionally, the blades of the ER-GB40-S are at a 45-degree angle so that you can get a quick cut that can slice through the thickest hair. You can snap off the single comb attachment that comes with the shaver to use it all over any part of your body. The sharp, stainless steel blades of the Panasonic Milano ER-GB40-S are an attractive feature that customers are raving about. The quality of the material used to make the ER-GB40-S is very high end, the stainless steel blades do not rust after years of use, the grip never wears, and it can stand multiple charges, uses, and showers for years. Another perk of the ER-GB40-S is that it's lightweight, and designed to last at least three years. It comes with a two-year warranty. OK, so the Milano looks good, but we don't buy a trimmer for its looks, it's time to see how it performs and what's the user experience is like. 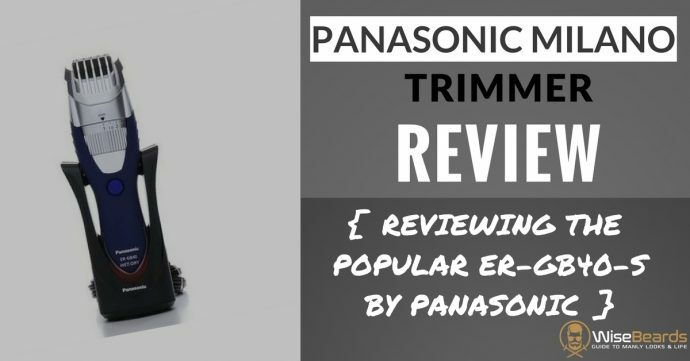 The Panasonic Milano ER-GB40-S is a rechargeable trimmer that comes with a charging dock. It takes about fifteen hours for this powerful shaver to charge fully. When you purchase the Panasonic Milano, you should let it charge for at least 23 hours. This ensures that the battery life of the shaver won't be compromised. That's a lot of time, so be prepared. Once the Panasonic Milano is charged, you'll be able to get about a week's worth of life out of it. If you're going on a business trip with a quick, two-day turnaround, then you can feel comfortable leaving the charging dock at home once it's charged fully and tossing the trimmer into your bag. The ability to leave the charger at home for a short business trip is fortunate because some customers felt that the sleek and modern charging dock took up quite a bit counter space compared to other charging docks for razors from the competition. Instead of providing a lot of attachments that you have to keep together, Milano eliminates the hassle since the rotating dial will adjust the length that you need for your beard in increments of 0.5mm (1/64''). There are 19 length settings: 1-10mm (1/32'' - 3/8''). Your setting will be locked in place regardless of how much the Panasonic Milano moves, so that you cannot accidentally move it either while you're shaving or if it's bumping against your things in your luggage. Note that the maximum trimming length is 10mm (3/8')', so if you're planning to use it for trimming you hair, make sure you don't need a longer setting. A lot of men reported having a clean, and relatively easy experience while using the Panasonic Milano ER-GB40-S. It is a gentle but powerful machine, and it runs similar to any tool that you would find in a professional barbershop. It doesn't tug or pull facial hair, and the dial fulfills its promise of staying locked in place. It's definately not powerfull as a corded trimmer, so if you want the power of a corded trimmer the Milano is probably not for you, don't be mistaken though, you'll get great trims with it. It's easy to hold with its durable comfort grip and will deliver the same results if you take it into the shower. You don’t have to worry about waking up the whole household with this razor because the noise that comes from the Panasonic Milano is minimal. The Panasonic Milano ER-GB40-S is easy to clean. You can wipe a damp cloth or towel over the exterior of the trimmer, or you can run it under water. It’s not recommended that you use harsh chemicals. However, if you do have a buildup, you can always use something gentle like dish soap to help you cleanse it. It requires some maintenance, you'll have to rinse the blades under warm running water and then oil the blades pretty often. This will keep the stainless steel blades from eroding, and you'll see a longer lifespan out of the Panasonic if you maintain it as instructed. If your Panasonic Milano lasts long enough for the battery to die, you can order a replacement battery for it from a third party vendor. Instructions on how to replace the batteries will come with the package. Additionally, if you need to replace the blades on your shaver, you can order extra blades for around $20, and you'll also be provided instructions on how to safely replace them. I really like the prescission trimmer attachment. It makes it very easy to precisely edge and finish small details, great for those who are looking to style their beard - you'll be able to style your mustache lines, neck and cheek lines easily. The price of the 3000 multigroom is very affordable ~16$. If you're looking for a multi-groom product for the whole family or for yourself this can be a great option. Click for more information. Who Should Buy the Panasonic Milano ER-GB40-S ? The Milano is great for those who are looking for a trimmer with many length settings that allows for styling. If you love trimming your beard while showering or use shaving creams and gels then this might be the perfect trimmer for you. As mentioned before the maximum trimming length is 10mm (3/8'') so if you need something longer, pick a different trimmer.